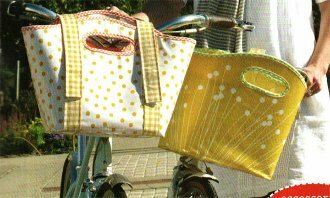 The Ilsa Handlebar Basket can be made from oilcloth or heavier weight laminated fabric. It converts to a handy market basket. Perfect for a bike ride to the farmer's market! Finished size 14.5" x 11.5" x 6"